There seems to be a hell of a lot of utilities to combine images (png's, jpgs etc) to form pdfs. But as a savvy user you've probably formed a distrust of shareware or similar. If you're like me, you've installed a few to find you need to register to get the features you need! Frustrating! Fortunately it's ridiculously easy with GraphicsMagick, an open source command line image manipulation power house (for free)! If "gm" isn't working, try opening a new command prompt to allow the path to be refreshed. 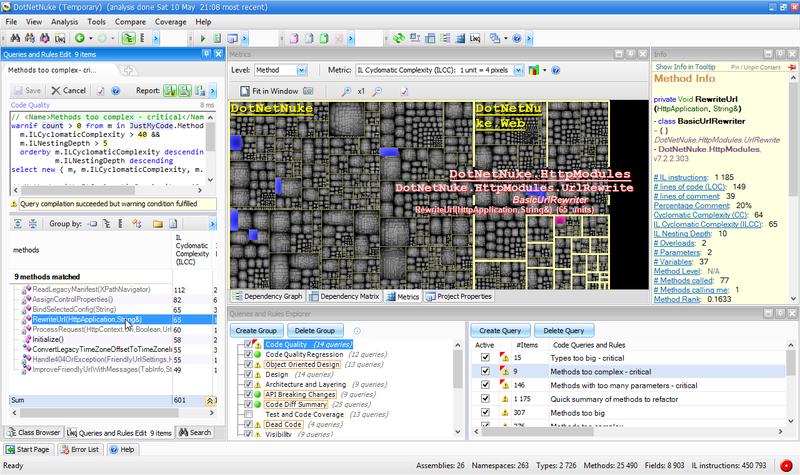 Patrick from nDepend kindly sent me over a copy of nDepend to try out. nDepend is a code coverage tool with a hell of a lot to give. 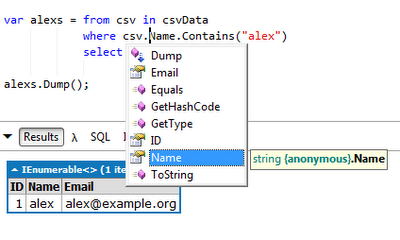 Think of it like FxCop / Visual Studio's Analysis tools but with a whole suite of tools to support the analysis. It's a great fit if you're looking to refactor your code, it can analyse it for problem areas (similar to FxCop) but it also has the capability to define your own metrics using "Code Query over Linq" (clever stuff indeed). One of my favourite features is the ability to get a grasp of existing architecture, as we all know that even though your team's documentation should of been written early on, it often becomes a low priority as soon as it hits production. It's also a nice way to explore open source projects and to take a look at the architecture the big players are using. Here is an example of examining the popular open source .net CMS DNN (previously DotNetNuke), we can see highlighted that the method 'RewriteUrl' is perhaps overly complicated. Clicking the function name opens visual studio directly with the file open in the right place (nicely polished - it even has Visual Studio integration). Reading over the RewriteUrl method it's a bit of a beast and could become a maintenance problem so could be a future task to refactor (for example). The screenshot may look complex as it's a power user tool, but nDepend is a very friendly tool offering contextual help along the way. A short blog post can't do it justice, if you're dabbling with refactoring and want something more powerful than the built in tools, I'd recommend taking a look at the nDepend website to learn more. "Exclusive access could not be obtained because the database is in use." 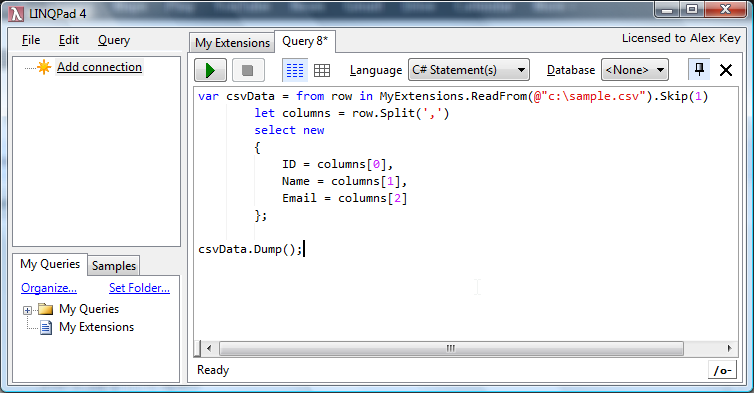 This simple one-liner will kick everyone off SQL Server (including any inadvertant connections from yourself e.g. edit table connections). This technique works fine on Microsoft SQL Server 2005 / 2008 and Express Editions (probably works on more versions). It works very quickly and allows you to restore you database straight away afterwards. This excellent tip was found on dba stackexchange. Please let me know if you found this tip helpful. 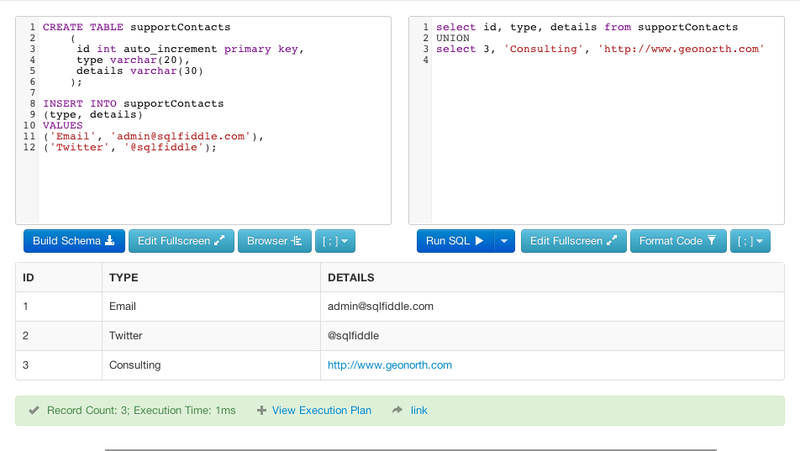 I came across a little gem; if you are ever stuck with some SQL and ask for some help in a forum etc, this free online sql editor called SQL Fiddle will allow you to create tables, run sql etc all online - ready to share with fellow developers. Git / Mecurial do not track empty directories, but there is a useful tool to help. To track empty directories, you need to simply create place holder / dummy files in those directories e.g. a simple txt file. If you have many folders or are importing an existing project into source control it can be a pain to create all the place holder files. Fortunately there is an easy to use command line tool that will scan through all your directories and generate dummy files for you at the bottom depth. Even better if you directory structure changes and a folder is not longer empty it will delete them for you. Now when you execute command it will be relative to the window instead. Incorrect syntax near the keyword 'OPTION'. When using CTE's inside a UDF. 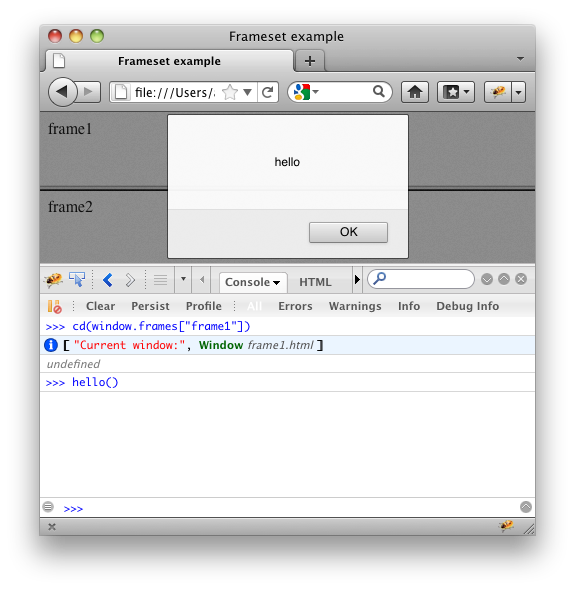 It is useful to use common table expressions (CTE) to perform recursive calls. Normally recursion is limited by default to 100 recursions, this is to stop infinite loops. 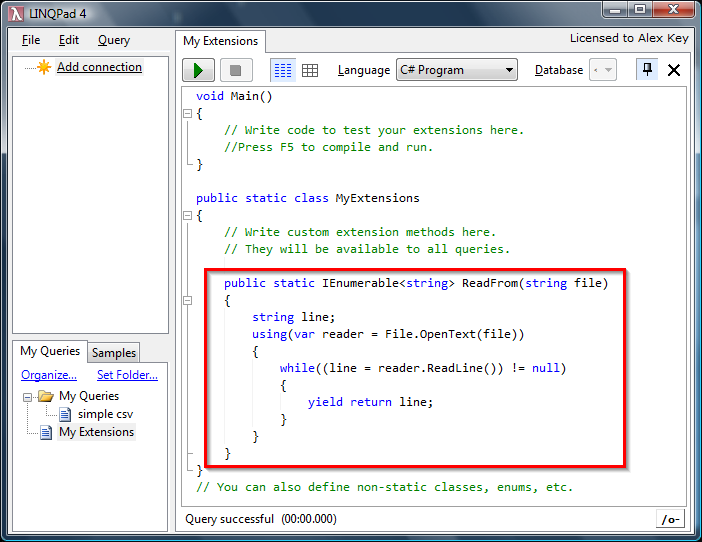 You can normally override the default using the MAXRECURSION query hint. e.g. Unfortunately if you set this inside a UDF, you will get the error: Incorrect syntax near the keyword 'OPTION'. This is a known issue mentioned in microsoft connect. Of course this solution is only applicable in some situations, some of you really need to be able to configure the recursion within the UDF. But when I came across this, it helped me. 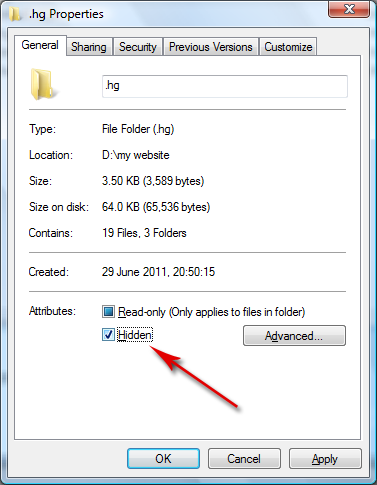 Simply browse to the folder in windows explorer and mark the folder as hidden in the folder properties. 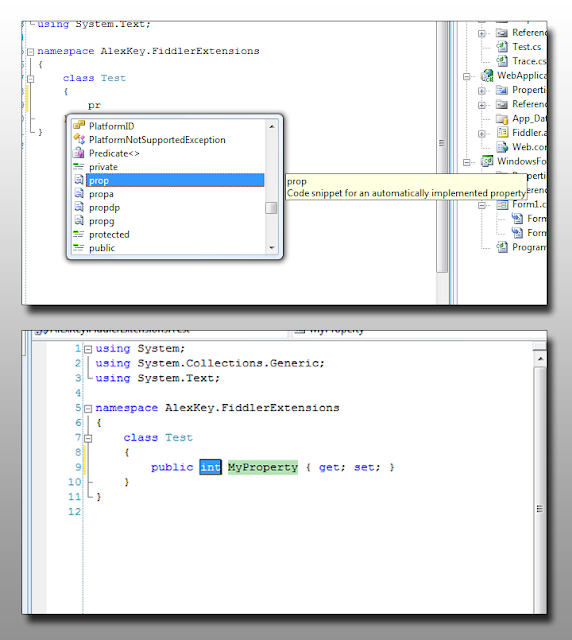 You may need to refresh the solution explore in Visual Studio to see the change. 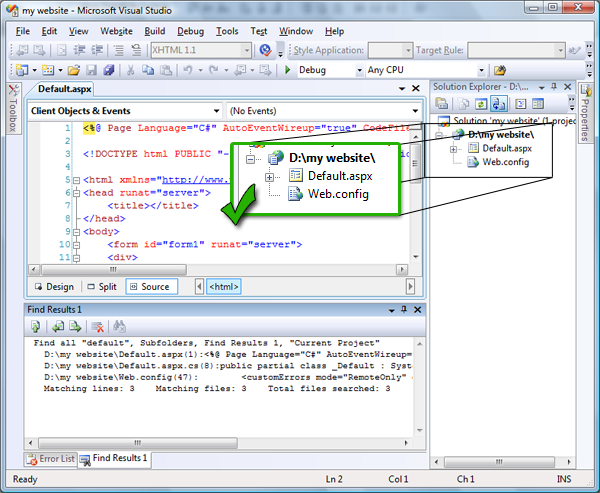 This has been tested in Visual Studio 2008 and 2010 and is useful for hiding .git and .hg folder, but can be used to hide any folder. 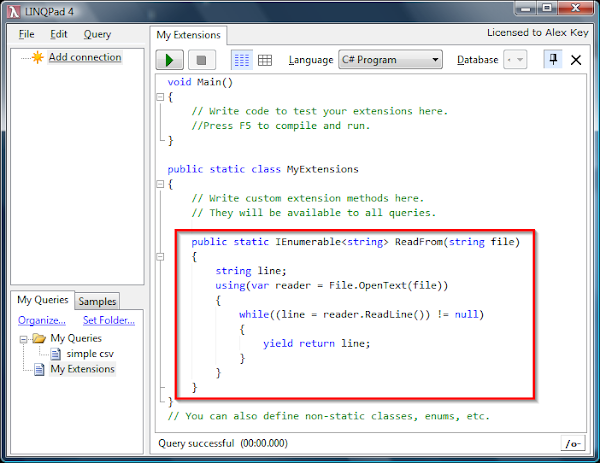 For other projects type in visual studio (class library, web application etc). 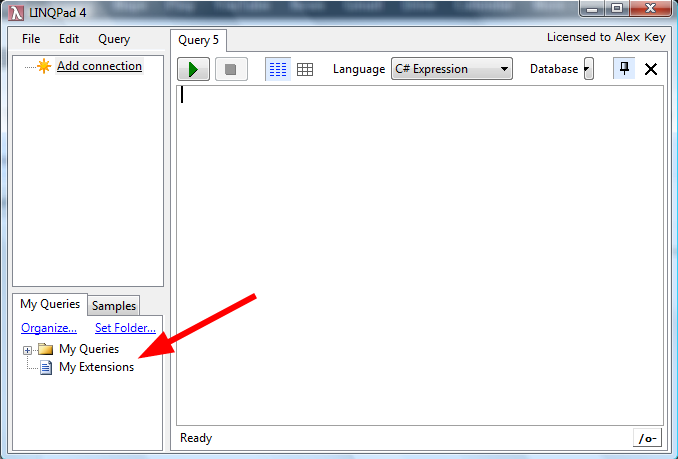 you can simply right click on the folder in the solution explorer and click exclude. If you distribute your SQL code to third parties (perhaps in runs on other peoples servers), you may wish to help protect your intellectual property by encrypting your SQL statements. Simply using "WITH ENCRYPTION" at the end of your normal CREATE PROCEDURE will stop the definition of your sql statements being returned. The statement will be automatically decrypted on the fly. 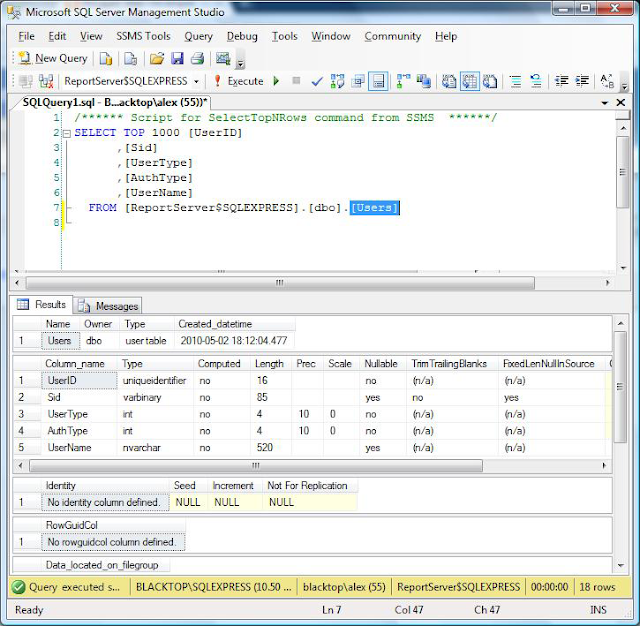 In SQL server 2000, the de-obfuscated text is stored in the SYSCOMMENTS table before it is executed. So you may wish to consider this as a preventative measure for the casual nosey parker, but not a bullet proof solution. 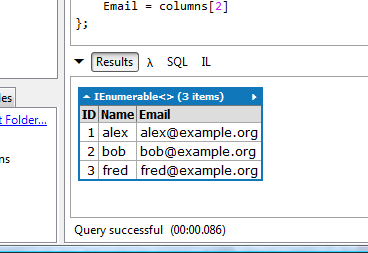 However the equivalent MSDN page for SQL 2008 R2 doesn't mention this. 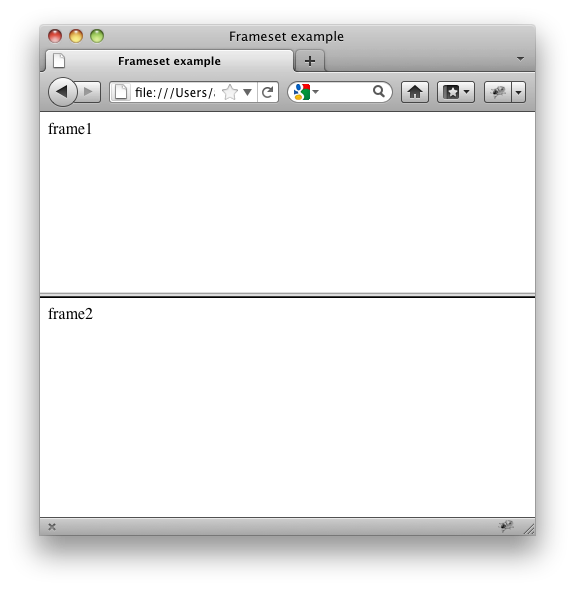 It's easy to simulate various screen resolutions (screen sizes) in Internet Explorer using the built in developer tool (built in since IE7). 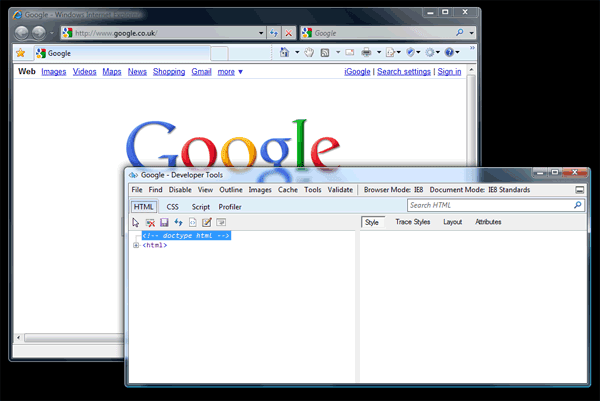 Allowing you to test your webpages in various screen sizes. 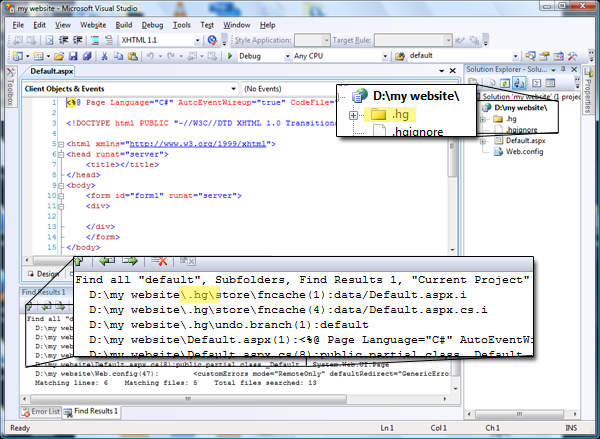 Simply go to the menu item as illustrated below or press the keyboard shortcut F12 to load the developer tool. The built-in IE developer tool should now open, as illustrated below. 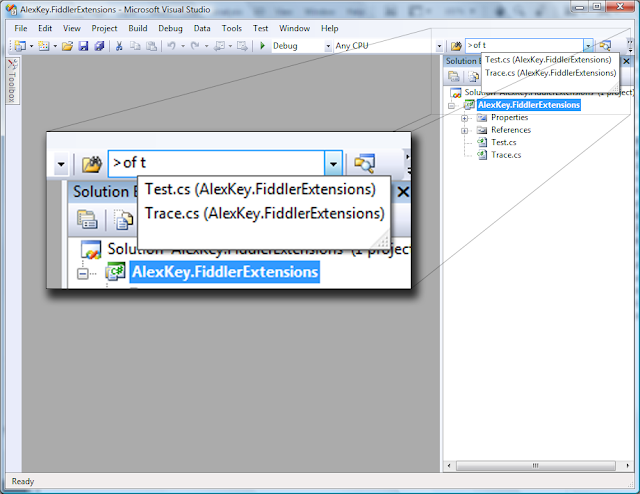 With the developer tool now open; in the menu click "Tools" > "Resize" and select the screen resolution of your choice. By default you can simulate, 800x600, 1024x768, 1280x768 and 1280x1024, which covers the most popular resolutions. However you can also provide your own custom resolutions. Notably, this is only a simulation of screen resolutions. It does not show you exactly what a person using these screen resolutions will see. It will only change the height/width of your browser window and will not effect font sizes etc etc. But it is far faster than changing your own monitor resolution each time you wish to test. The resolution simulation is therefore very useful for testing CSS layouts, but perhaps not as useful if your testing for accessibility compliance etc. You could use this technique for day-to-day testing, coupled with actually changing your monitor resolution (more time consuming) for more in-depth testing. 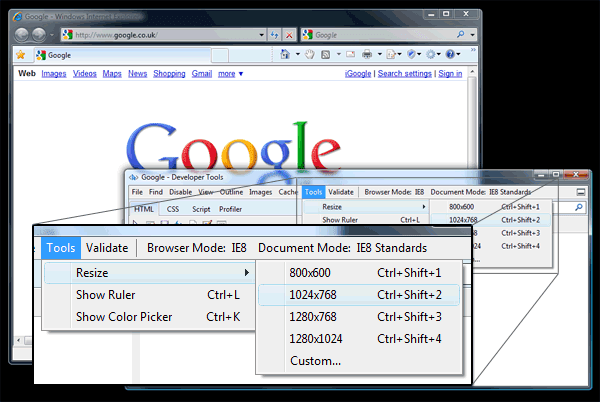 This tip has been written for Internet Explorer 8 under Vista, but it should be very similar for IE7+ under XP+. 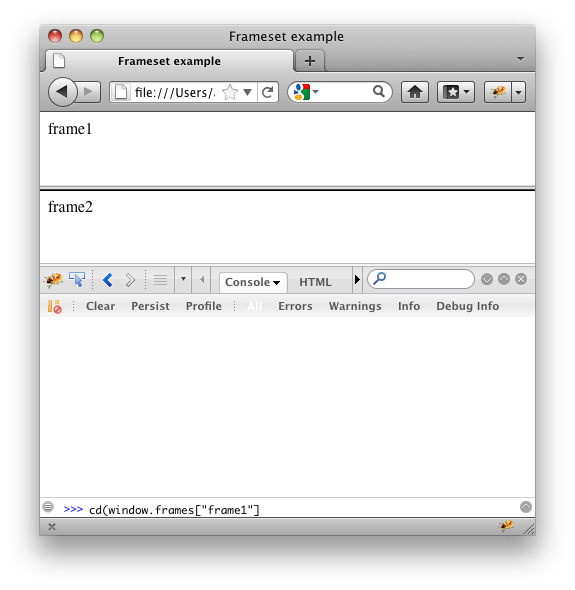 You can easily simulate a slow internet connection, by using a tool called "fiddler". Perhaps you are trying to debug a web application that is behaving strangely on other peoples computers (but is working fine on your own?!). Perhaps you wish to simulate a slow modem or a slow corporate VPN. 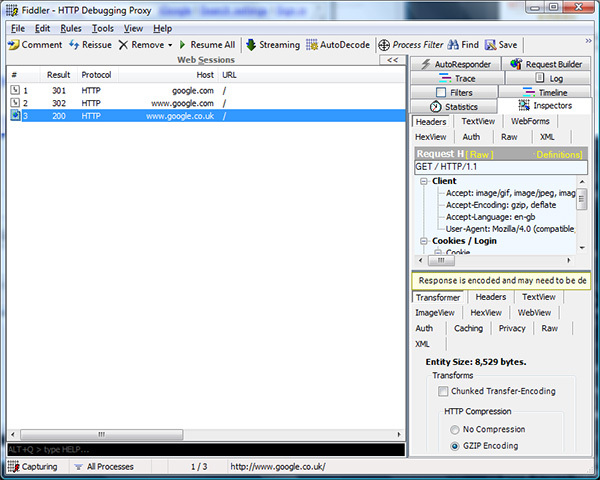 The fiddler is a web debugging proxy which logs all HTTP traffic between your computer and the internet. The fiddler has a setting to temporarily throttle your internet connection, to make your connection behave like a slow modem. The great thing about the fiddler is that it "automagically" sits in between all your web browsers and the internet, so it works with firefox, internet explorer, chrome etc etc. 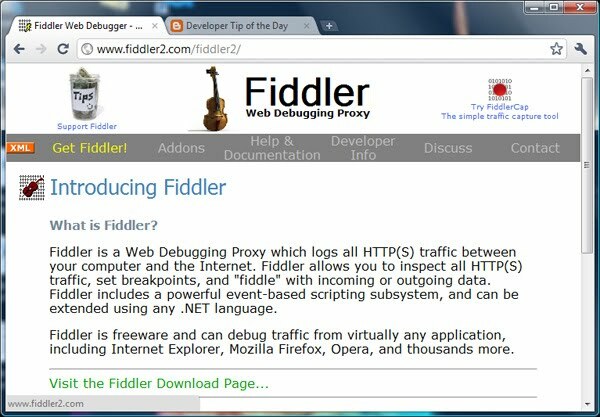 Firstly you need to install "fiddler", just go to http://www.fiddler2.com, download it and install it. It installs in seconds and has a getting started guide if you need it. Once you have the fiddler installed, open it and once loaded you should see a window similar to below. It should automatically act as a proxy, so if you browse to a website in any browser you should see it being logged in the fiddler. If not already opened, open the fiddler. Click "Rules" on the top menu. This is only scratching the surface of what the fiddler is useful for. There is plenty more information and an introductory video in the fiddler help section. You do not need to use the language attribute because the attribute has been deprecated since HTML 4.01, this can be seen in the "Designing documents for user agents that support scripting" section in the HTML 4.01 Specification. Of course using breakpoints and stepping through the debugging, is more often a better option (I'll do a quick post on how to do this at a later date), but in many situations outputting to the console is very useful. 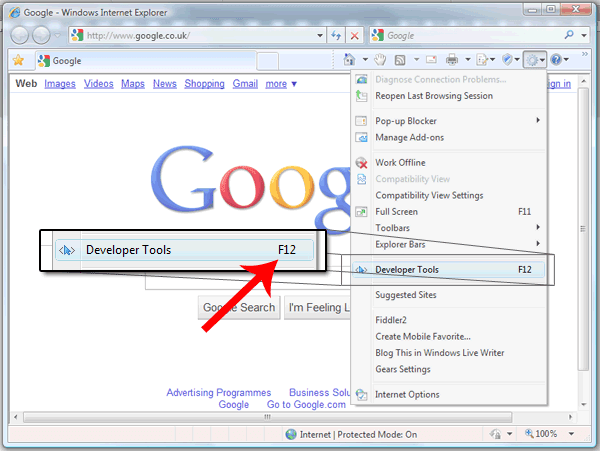 The IE developer tool bar is built into Internet Explorer 7+ (I pressume it will also be in IE9+). As mentioned above you can access it by pressing F12 (or by using the menu). You can do a "search as you type" in Visual Studio 2010 to find what you need very quickly. And then begin typing in what you are looking for (it will begin searching on the first letter). To go to the next result, press Ctrl + i again. If you have misspelled, simply press backspace (it doesn't delete your code as you'd first think). Great for quickly moving around a single file of code. It can also be found in the menu edit > advanced > make upper case. I won't go into to much detail, as the site sells itself. 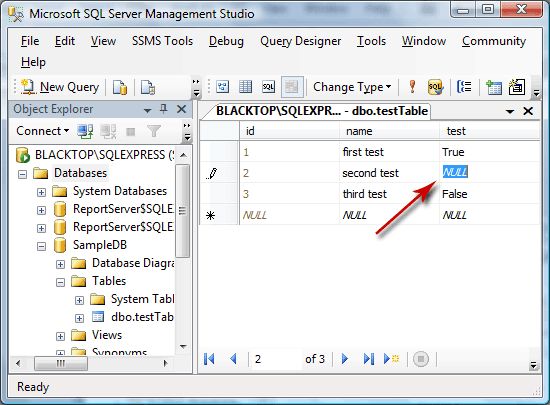 You can filter your list of tables in SQL Server Management Studio by doing the following (below). This is especially useful if you have lots of related tables and your only interested in a particular set of them e.g. every table with "user" in the table name. This brings up a dialog window allowing you to choose your search criteria (only simple criteria can be user e.g. name, owner, so you cannot use OR/AND etc). After clicking enter your tables are filtered (in the example by all table names with the word "user" in them). 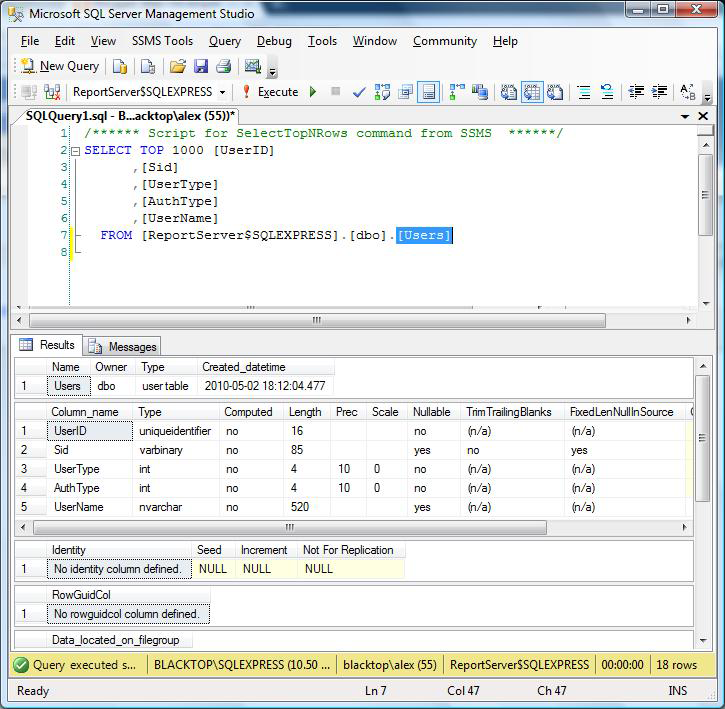 This example is in Sql Server Management Studio 2008 R2 (but it should work in 2005 and perhaps lower). and press ALT + F1 it will display the details of that table. In the background shortcut key will execute sp_help on your behalf, so in this example it executes: sp_help users, which is much quicker than typing it.